Soon you will be able to go to your nearest Sears and purchase clothes inspired by Seventeen magazine. Is it a women's magazine or is a clothing line? That's a stupid question; it's a brand. 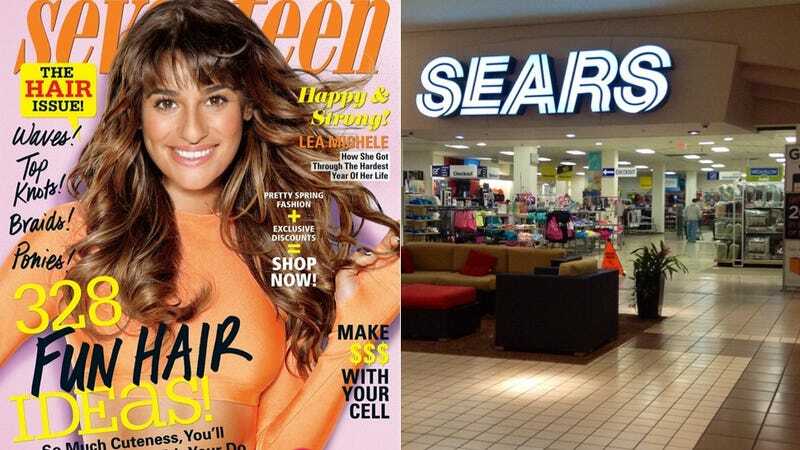 Women's Wear Daily reports that Sears and Seventeen have teamed up to sell clothes for teens in their stores and online (the stores will have "interactive elements" and "charging stations." Very Chanel). Styles include "a hearts-and-roses theme with flowers on cropped tops," "plaid shirts worn with blazers," "dresses shown with military jackets for a bit of an edge" and "lots of lace and a boho theme." So...how Forever 21 has been making a fortune for several years now. Sears already has the platform Sears' Shop Your Way on which customers can curate lists of stuff they'd like to buy, plus accumulate points and discounts to actually help them buy those things. The clothes from Seventeen will be available on Shop Your Way, just as clothes available within Glamour magazine can be purchased on their new app. Seventeen already sells bedding at Sears and JC Penney. In the past, they've sold bags and shoes at JC Penney, plus jewelry at Kay Jewelers (all for prom, of course). Elle, which is also owned by Hearst, has a line of clothes sold at Kohl's called the Elle Contemporary Collection but those aren't targeted to such a young teen-to-college-age demographic. This push is a clear move by Sears to try and convince customers that they're young and hip as their earnings falter. The company's revenue for 2013 was $10.59 billion, a drop of about $1.25 billion from the year prior. In 2013, Forever 21 was estimated at $3.7 billion – and growing. As Sears is an entire department store with competitors Wal-Mart or Target, these numbers aren't really comparable, but they do demonstrate that Sears is struggling to remain relevant in a way that Forever 21 isn't. The retail landscape where Sears used to really shine has changed too. At one point, a Wal-Mart and a Sears were all that many Americans had near them. With the internet, companies like Forever 21 have been able to sell to Americans they could never reach before. For their part, Seventeen is doing pretty well. It has a circulation of 2 million and boasts 12 million readers a month, making it the most popular teen magazine on the market. Not to get too nostalgic/blast-from-the-past-y, but YM and dELiA*s really missed a great opportunity to team up when they had the chance.